Most people would have forgotten about defragmenting their hard drive by now because of two reasons, which are if their hard drive is a solid-state (SSD) or the newer Windows operating system already automatically schedules to optimize your hard drive every week. Apart from that, defragging the hard drive actually offers very little performance gain that is noticeable by the user. However there are some users that are obsessed with keeping their computer in top shape. Hence there is third party disk defragmenting software still available to download and claiming to work better than the Disk Defragmenter tool built in to the Windows operating system. A good disk defragmenting software must come with intelligent algorithms and not just based on simple logic. Unfortunately some disk defragmenting software fails to defrag files and folders belonging to security applications such as an antivirus. Kaspersky is well known to have strong self protection that prevents unauthorized modification to its own files, folders, registry values and even the ability to configure or control the program remotely. This would mean that certain disk defragmenting application won’t be able to defrag Kaspersky files in Windows, unless a defrag is scheduled to run during boot before Windows is loaded. We’ve tested more than 10 different free third party disk defragmenting applications and have identified the ones that can defrag protected files in Windows. We used PassMark Fragger to scatter the maximum large fragments of the bl.ppl protected file located in C:\Program Files\Kaspersky Lab\Kaspersky Anti-Virus 15.0.2\ all over the hard drive. Then we ran a full defragmentation on the disk using the third party software and once the defrag has completed, we use PassMark Fragger again to analyze the fragments of the file to determine if the bl.ppl file has been successfully defragged or is still fragmented. UltraDefrag is an open source disk defragmenter that has a very simple and old school graphical user interface. Other than being able to defrag protected files, it can also perform quick, full or MFT optimization. You can also schedule for boot time scan with scripting support to defrag locked files such as the paging and hibernation files. You can also manually defrag specific files using the right click context menu by right clicking on the file, go to UltraDefrag and select “Defragment”. UltraDefrag is the ONLY free defragment tool in this category that does not come bundled with adware and is also one of the smallest in file size. Software produced by IObit is well known to work at the lower level of the Windows operating system and one of their tools called IOBit Unlocker has the ability to manipulate (unlock, rename, delete, move) files that are protected by antivirus. We can expect the same from Smart Defrag where it is able to defrag files that are in use or protected by Kaspersky. You can defrag individual files or even the whole folder through the right click context menu, or by ticking the “Added Files & Folders” checkbox from the main GUI. Do take note that the setup installer bundles third party adware which needs to be skipped in order to avoid installing the unnecessary software. Auslogics Disk Defrag is one of the most popular product at the company that has won numerous awards from independent tests including CNET. 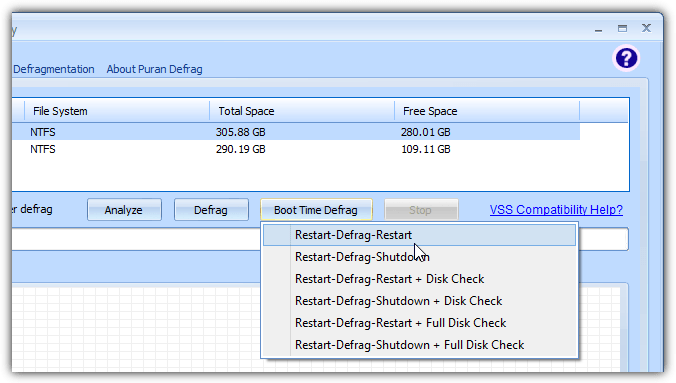 There are 2 versions available for Auslogics Disk Defrag which are the free and paid Pro version. The main difference between the 2 versions are the additional optimization algorithms that improves overall system performance. There is an option to defrag individual files or folders by clicking the Action menubar, go to Advanced and select either Defrag File or Defrag Folder option. To our surprise, PassMark Fragger shows that the selected file is still fragmented after using Defrag File option with the program reporting that defragmentation of the selected file is complete. However when we defrag the whole drive, then the fragmented file is properly defragged. This happens in Auslogics Disk Defrag version 6.0.0.0 in Windows 8.1 32-bit. Do take note of the bundled adware in the setup installer. Anvi Ultimate Defrag is created by the Chinese company Anvisoft with a dubious reputation as revealed by Brian Krebs, a well known American journalist and investigative reporter. Anvi Ultimate Defrag is a more simple defragging tool compared to the ones mentioned above with nothing much to configure. It does perform a few different functions such as repair, clean, defrag and optimize with a single click. It is not possible to selectively defrag individual files or folders from Anvi Ultimate Defrag. You can only opt to defrag the whole hard drive and PassMark Fragger confirms that it is able to defrag the Kaspersky locked files. We’ve tested the disk defragmenting tools in Windows 8.1 and PerfectDisk Free Defrag doesn’t work on the operating system as it always reports about the two revision levels being incompatible. Windows Disk Defragmenter, O&O Defrag Free Edition, Puran Defrag, WinContig, MyDefrag, UltimateDefrag Freeware Edition v1.72 and the most popular, Piriform Defraggler, isn’t able to defrag protected Kaspersky files in Windows. The self-defense mechanism in Kaspersky is the cause of preventing most defragmenting tools from defragging the files it protects. If you want to defrag Kaspersky protected files using any of the defrag tools that cannot ordinarily defrag them, a simple workaround is to temporarily disable Kaspersky self-defense. Run Kaspersky, click on Settings located at the bottom of the program, go to Additional > Self-Defense and uncheck “Enable Self-Defense”. Once the self-defense is turned off, you can now run a full defrag using any of the disk defragmenting software that cannot defrag locked files. Make sure you remember to re-enable the self-defense after defrag. Alternatively, you can enable the Boot Time Defrag in Puran Defrag so that it runs a full defrag before Windows is booted up. Do take note that the Boot Time Defrag in Defraggler only defrags the pagefile and registry files but not the whole disk. thanks ray. would be very useful once i’ve changed my antivirus to kaspersky. Hi, thank you for this interesting tip. Good tricks. I didn’t notice it.